The headline shocked the nation: President Lincoln Shot by Assassin John Wilkes Booth! One of the most exciting stories in American history told with full color illustrations. The fifth installment in Don Brown’s Actual Times series featuring significant days in American history covers the Lincoln assassination and ensuing manhunt. In He Has Shot the President!, both Lincoln and Booth emerge as vivid characters, defined by the long and brutal Civil War and set on a collision course toward tragedy. 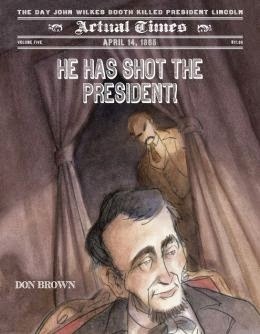 With his characteristic straightforward storytelling voice and dynamic watercolor illustration, Don Brown gives readers a chronological account of the events and also captures the emotion of the death of America’s greatest president. Read more about Abraham Lincoln here.